(by Colleen Jenkins, Reuters) WINSTON-SALEM, N.C. — A federal judge upheld a North Carolina law on Monday that requires voters to show certain forms of photo identification at the polls, in a key victory for Republicans in a presidential election year who say the law is needed to prevent voter fraud. “In sum, plaintiffs have failed to show that any North Carolinian who wishes to vote faces anything other than the ‘usual burdens of voting,'” Schroeder also wrote. The NAACP and individual voters backed by the U.S. Justice Department had argued that the law disproportionately burdened African-Americans and Hispanics, who are more likely than whites to lack the acceptable forms of identification. Democrats argue voter ID laws passed by Republican-led state legislatures target voters who typically support the Democratic party. Proponents of the measures say they are intended to prevent voter fraud. The trial in Winston-Salem was one of a number of closely watched voting rights battles across the country playing out as Democrats and Republicans fight for the White House in November. 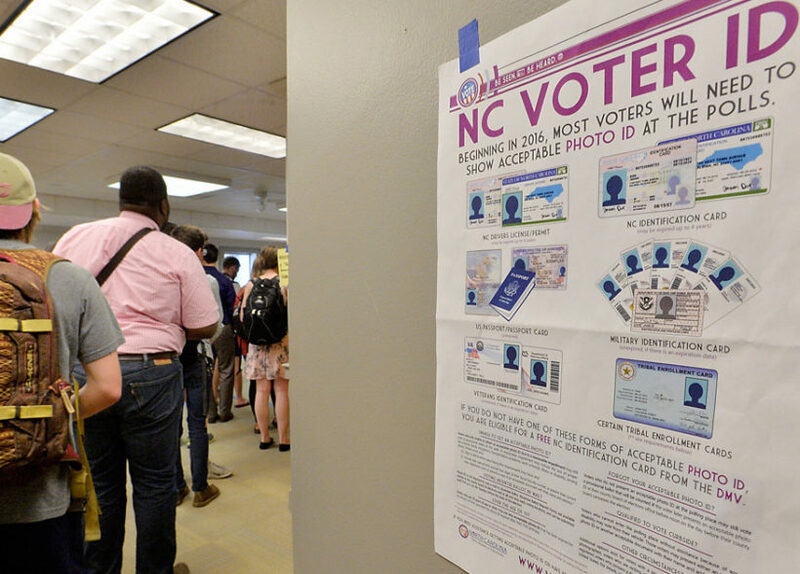 The North Carolina law requires voters to show approved credentials such as a driver’s license or passport before casting a ballot. Voters who cite a “reasonable impediment” to obtaining such identification are allowed to cast a provisional ballot. Schroeder also upheld provisions that eliminated a week of early voting, same-day registration, and prohibited the counting of out-of-precinct ballots. Schroeder said that the plaintiffs did not establish that blacks or Hispanics had less opportunity than others to participate in the electoral process, and pointed out that North Carolina joins only South Carolina in extending voters the “reasonable impediment” accommodation. Opponents of the law said they would pursue an appeal. 2. What Supreme Court ruling were the plaintiffs challenging regarding North Carolina’s voter ID law? 3. How did district Judge Thomas Schroeder explain his decision? Be specific. 4. For what reason did the NAACP and the Obama administration’s Justice Department argue against the North Carolina voter ID law? 5. List the three additional provisions to North Carolina’s voter ID law that Judge Schroeder also upheld. 6. Republicans say voter identification is necessary to prevent voter fraud. Democrats say identification should not be required to vote because it causes voter disenfranchisement. They say that it prohibits people who don’t have a driver’s license, passport, or other photo ID, from voting. With whom do you agree? Explain your answer. 7. a) In what situations do people currently have to show ID? b) Ask a parent: In what situations do you currently have to show ID? c) Do you think citizens should be required to show photo ID in order to vote? Explain your answer. 8. a) Do you think voter ID laws will improve or harm the integrity of elections? Explain your answer. b) Voter ID requirements are not uncommon. Currently 33 US states enforce identification rules before allowing citizens to vote in person and that number is continuing to rise. Do you think states should implement these new ID requirements for voters? Explain your answer. From the North Carolina government website, read: What forms of Photo ID are acceptable for voting?